India’s largest iron ore miner is holding talks to buy coal assets in Russia. Analysts say it could take the form of a joint venture. Mining is a new business alchemy emerging between India and Russia. NMDC, India's third largest mining company, is negotiating the acquisition of four coal mines in Yakutia, one of the coldest places on earth. Swaminathan Thiagarajan, the financial director at NMDC, is excited at the new deal, which he says, is likely to be clinched by December. The Yakutia coal will be delivered to two steel mills being built in Chattisgarh in eastern India at a cost of $3.6 bn and a launch date of 2014 and to $2 bn plant at Karnataka in South India, the official said. The coal assets are owned by Kolmar, an affiliate of Intergeo, the mining behemoth owned by Russian billionaire Mikhail Prokhorov's ONEXIM Group, which is dreaming big to become one of the largest coal-mining companies in Russia by 2012. 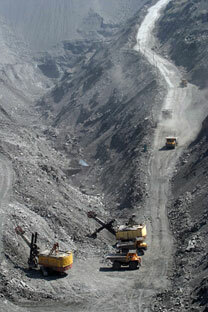 Yakutia, says analyst Boris Krasnozhenov, has quality coal and the deposits are close to Far-East ports. Price is an added attraction: coking coal mining costs work out to be just $40 to 45 a ton in Russia compared to $68 to 125 in traditional coal exporting countries such as Australia and the US. He estimates the deal to be around a dollar per ton of Kolmar's reserves, or roughly $400 mn for four mines, plus a premium on assets already in effect. The price suits NMDC fine. Indian metal-makers not backed by coal are trying to get themselves a safety net against commodity-price volatility in the wake of world suppliers having brought the axe down on the forty-year old annual contracts system and having switched to a quarterly pricing system, says Thiagarajan. With huge stakes involved in Kolmar coal, Inergeo is thinking of creating a joint venture, says Olga Mitrofinova from IFD Kapital. It could take the form of NMDC outfitting the project with equipment in exchange for guaranteed volumes of coal deliveries, Krasnozhenov points out.